Save Our Scruff is a Toronto based non-profit dedicated to rescuing street dogs and finding them permanent homes. They have recently started addressing the street dog problem at its source by conducting spay and neuter clinics in the developing world. Founder Laura Bye started the organization after being a dog foster parent for another organization exposed her to the harsh realities facing dogs worldwide. Using her previous dog rescue connections, Bye was able to fly several dogs to Toronto from Los Angeles and Mexico to stay with five friends she convinced to foster dogs for her. Since then the organization has grown, and now consists of Bye and over 1200 volunteers from the greater Toronto area. They work with international rescues to bring in dogs in need of homes, and foster them until forever homes are found. Thus far over 1000 dogs have been adopted thanks to the organization. Yet Bye realizes that adoption doesn’t solve the root cause of the problem, so the organization has started conducting spay and neuter clinics in Mexico and the Dominican Republic, with plans for Peru next year. 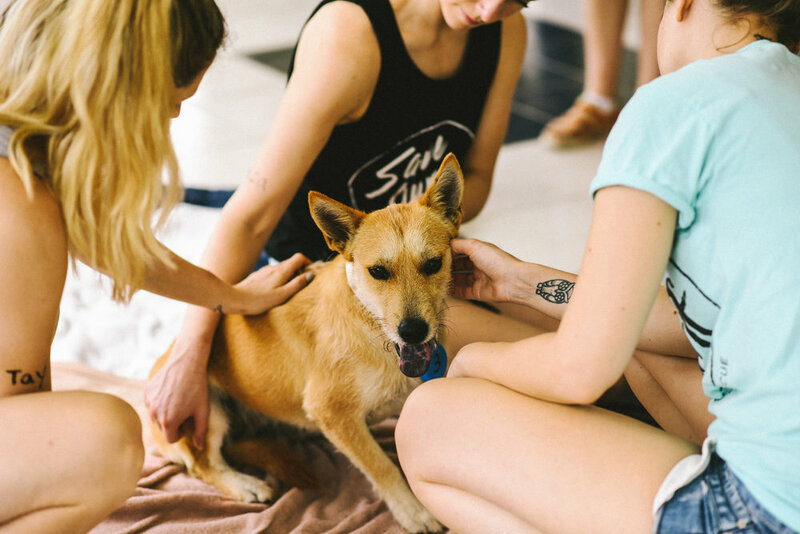 Megan Ewing is a Save Our Scruff volunteer, the former creative director of Photographers Without Borders, and a photographer who went to document the organization’s most recent spay and neuter clinic in Sosua, Dominican Republic. Save Our Scruff partnered with GeoVeterinary International to facilitate the clinic. Representatives of GeoVeterinary International came to the Dominican Republic from the United States in order to perform the surgeries, while Save Our Scruff volunteers focused on the setup, cleanup and promotion of the clinic, as well as the pre and post-operation needs of the animals. Over several days more than 120 dogs were spayed or neutered, as well as vaccinated and treated for fleas and ticks. Though most of the animals were pets brought in by locals looking to take advantage of the free veterinary services, Bye and several other volunteers ventured into neighbouring villages to capture stray females to bring to the clinic. It was with these stray animals that Ewing felt a particularly strong attachment. “I think I cried for four days, it was really emotionally tough because I am such an animal lover I wanted to bring them all home,” said Ewing. She fell in love with a dog the team named Christina Aguilera, who was found on the street. Once at the clinic she was found to have had a uterus so infected and swollen, it was several times its normal size and had to be removed. “She was so happy, the next day she played with us and wouldn’t leave our side,” said Ewing. After the surgery, the canine Aguilera stayed at a local dog rescue for the requisite 21 days needed after vaccination, before being flown to Canada. “She went from living on the streets, probably uncomfortable and in pain and giving birth to litters when she shouldn’t be, she’s too old and not healthy enough, to being taken care of, happy, and now coming to Canada to start a new life,” said Ewing. Both Ewing and Bye hope Ewing’s photos show both the nature and scope of the problem in the developing world, as well as what Save Our Scruff is doing to solve it. “Unfortunately I can’t show everybody, I can’t bring everybody abroad with me and teach them,” said Bye when discussing how the photos will be useful in getting the organization’s message across. To learn more about Save our Scruff and how you can donate, click here. You can see more of Ewing's photos of Save Our Scruff on Instagram, @mewingcreative.